Jerome Myers' "Pursuit of Pleasure," part of the new Hillstrom Museum of Art exhibit opening November 20. The Hillstrom Museum of Art at will be a busy place the next two weeks with the opening of new exhibits, Jerome Myers: The Ash Can Artist of the Lower East Side and Stuart Klipper: The World in a Few States. The official opening reception of the exhibits is from 7–9 p.m. on November 20 and features expert Dr. Robert L. Gambone speaking about painter/printmaker, Jerome Myers. One week later, there will be a unique opportunity to “meet the artist” as photographer Stuart Klipper comes to campus to work with Gustavus students and talk about his exhibit at 4 p.m. on November 27. Both events are free and open to the public and the exhibits are open until February 2, 2018. Gambone, an art historian, essentially “wrote the book” on Jerome Myers. His monograph, Jerome Myers: The Ash Can Artist of the Lower East Side, has been instrumental in the creation of this exhibit. Gambone’s expertise on Myers, who some argue has not been recognized for the incredible quality of his work, brings an in-depth look at the forces of history that shape his legacy. Director of the Hillstrom Museum, Donald Myers (of no relation to the artist), hopes that Gambone’s deep knowledge about the artist can help museum-goers understand the importance of Myers, regardless of how history portrays him. “Robert Gambone is the world’s expert on Jerome Myers and he, better than anyone, can put the artist in the proper context for understanding his accomplishments,” he says. 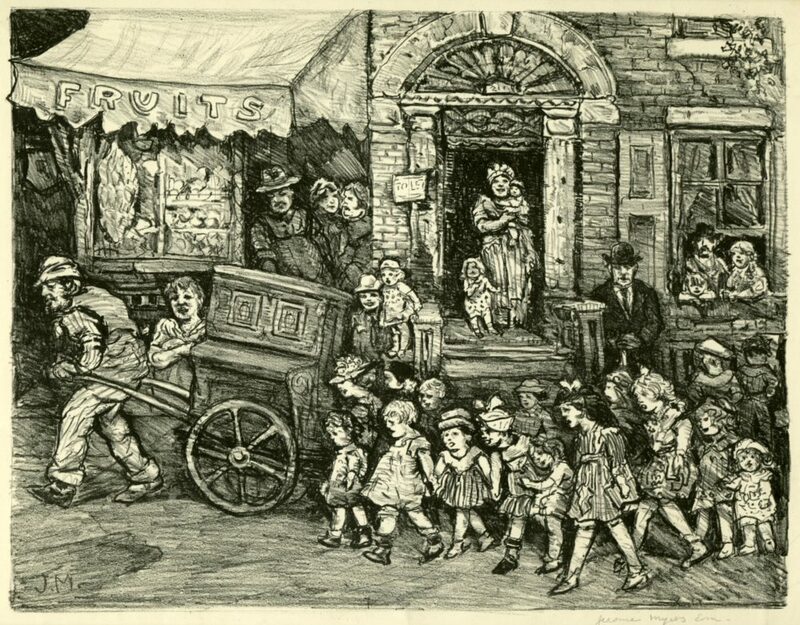 Myers was one of the first artists to explore depictions of life of immigrants on the Lower East Side during the early 20th century. While he is not typically recognized as part of the “Ash Can School,” a famed group of eight newspaper illustrators turned artists who fundamentally changed the face of art, Gambone and Donald Myers both believe his impact is one to be examined. “I hope those in attendance will appreciate Myers as an important artist who deserves to have the kind of attention that other Ash Can artists typically receive,” Donald Myers says. Stuart Klipper’s exhibit features panoramic photographs from all 50 states and the District of Columbia. Klipper is a prominent photographer who has traveled the world taking photographs including the North and South Pole, the Aboriginal outback of Northern Australia, and the far reaches of Patagonia and Tierra del Fuego in Chile and Argentina. His work has been featured in museums around the world including the Museum of Modern Art (New York), the Art Institute of Chicago. “I travel to very remote parts of the planet, to very extreme places. When I came home again there was an idea of dropping anchor in home ground,” he says. This inkling is what drove him to create the exhibit featuring the beauty of the United States. While on campus, Klipper will work with students in both photography and senior seminar classes, and speak with them about his work, inspiration, and funding sources. He is an ideal person to discuss these things as he has been the recipient of many grants and fellowships from places like the Guggenheim Foundation, Bush Foundation, McKnight Foundation, the Minnesota State Arts Board, and the National Endowment of the Arts. The visit is funded through a partnership between the Gustavus Art Department and the Hillstrom Museum of Art. For more information on both exhibits, please visit: www.gustavus.edu/hillstrom.